This makes 8 individual puddings. Place linseed, cinnamon, cloves, nutmeg and ginger into high speed blender and pulverize for 1 minute on the highest speed (Thermomix 1min/speed 10). 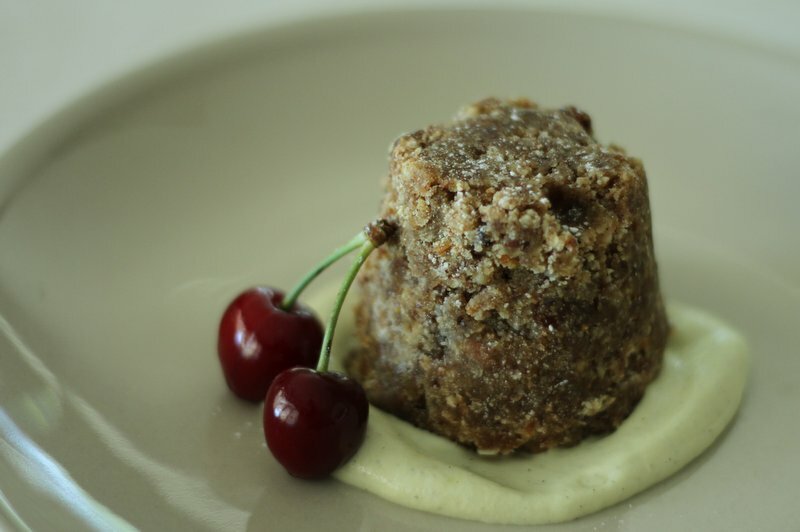 Place walnuts, almonds, sultanas, dates, cherries, peaches and figs into a food processor with a “s” blade or Thermomix and chop on a medium speed for a few seconds until you see see a mixed fruit texture. Add RAW flour, orange, lemon, vanilla, almond extract, nut butters, syrup and salt and combine until mixture froms a ball. Shape mixture using a darion mould or small teacup, place on a baking paper lined dehydrator sheet and repeat until mixture is finished. Dehydrate at 105°F (around 40°C) for approximately 6 hours.